Kalidaha is a famous spot associated with Bhagavan Srikrishna on the banks of Yamuna River in Vrindavan, Mathura. Kaliadaha is a small pit on the bank of Yamuna River and the demon serpent Kaliya stayed here with his family. Daha is a small cavity or pool of water, which is exceptionally deep. Kaliya Serpent polluted the entire Yamuna River by emitting toxic vapors. The poison killed trees, plants, herbs, birds, reptiles and other animals which depended on the waters from Yamuna. Little Krishna who realized that the presence of the Kaliya was making Yamuna poisonous decided to get rid of the serpent. 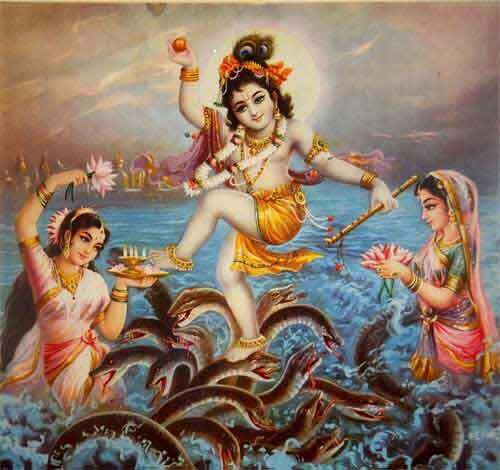 On the pretense of retrieving a ball accidentally thrown into the part of the river, Krishna jumped into Kalidaha. There he fought and defeated the demon snake Kaliya. When the wives of Kaliya intervened, Krishna pardoned the serpent on the condition that he will leave Yamuna and live far away from other living beings.